River Plate were held to another draw in the Copa Libertadores, while Flamengo maintained their perfect start on Wednesday. Defending champions River played out a second straight draw in Group A, held 0-0 at home to Palestino. 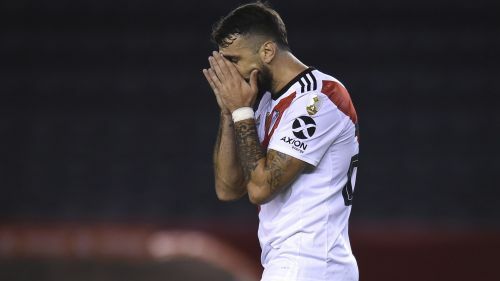 Playing behind closed doors at the Monumental due to punishments handed down during their controversial final win over rivals Boca Juniors, River were unable to find a breakthrough. They are second in a group topped by Internacional, who beat Alianza Lima 2-0 thanks to a Nicolas Lopez brace. Flamengo made it two wins from as many games in Group D courtesy of a 3-1 victory at home to LDU Quito. Everton Ribeiro scored the opening goal in the ninth minute, and Jefferson Intriago missed a penalty for the visitors on the stroke of half-time. Gabriel Barbosa – on loan from Inter – drilled in the second for Flamengo before Fernando Uribe sealed the win despite Cristian Martinez's late penalty for Quito. Elsewhere, Luciano Aued's 96th-minute penalty saw Universidad Catolica edge Rosario Central 2-1 in Group H.
Nelson Valdez's double guided Cerro Porteno to a 2-1 win over Zamora, while San Lorenzo overcame a 10-man Junior 1-0.